After seeing the success in China, the International Task Force for Disease Eradication in 1993 listed LF as an eradicable disease. This designation was based on the fact that transmission can be stopped by one dose of medication annually for about seven years or the use of DEC salt. Since the parasite lives in the lymph nodes and produces a smaller form (microfilariae) in the blood, DEC significantly reduces the transmission of the disease since it makes uptake by the mosquito vector impossible by killing the microfilarial load. Thus, once transmission has stopped, only the adult worms residing in the lymph nodes must be killed by the regular drug method to stop the life cycle. After designating LF as an eradicable disease, the WHO made a goal for its eradication in the Americas 2015 and decided to make Guyana into a test case. Guyana has been the first test of DEC salt in an open market. [vii] The Chinese program was much more controlled, so it was easy to achieve high coverage of a large population. Distribution and preference were both problems in Guyana. The program began in 2003, but was plagued by problems. First, people usually didn’t buy individually wrapped salt. Instead, stores would parcel it out as needed to make it cheaper. DEC salt was packaged separately and more expensive. Another problem was that the label said it contained potassium ferrocyanide, an anti-caking agent that had been in salt for years, but which scared people away since they only knew what cyanide was from the Jim Jones cult that had committed suicide in Guyana in 1978. The third problem was that the batch of salt originally sent was blue. This did not affect the taste or efficacy, but put people off of buying it. Finally, in 2004, the supply of DEC salt, which all came from one plant in Jamaica was disrupted by hurricane Ivan, leading to a supply disruption and loss in consumer confidence in 2005. 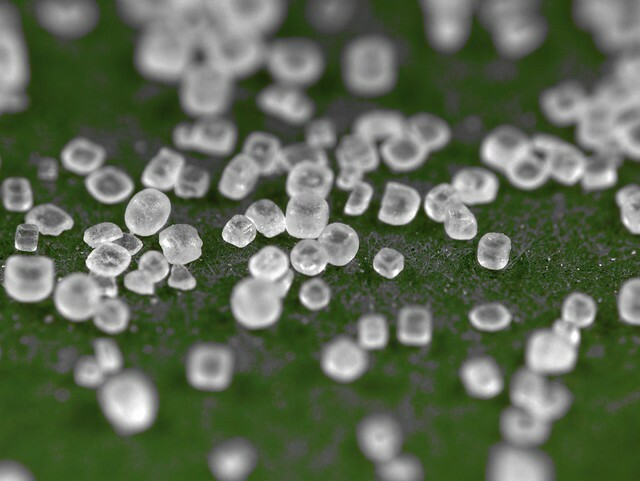 By then, only a third of the population used DEC salt and only half of stores carried it. Now, in 2010, coverage of DEC salt in Guyana is still relatively low. Unfortunately, the fact that the Guyana test case was not nearly as successful as China’s program will make other countries more cautious in starting their own LF eradication programs using DEC salt. The scientists who recommended it originally hope that people will eventually recognize the efficacy of the treatment and follow suit but question the choice of Guyana, which didn’t even have a successful iodization program in place, as a forerunner for another program in salt fortification. [viii][ix] Hopefully, other countries will have more success in open market distribution of DEC salt and accompanying LF treatments and bring an end to this disfiguring but eradicable disease. [i] Cassandra Willyard. “Salt of the Earth.” GeoTimes, June 2008, http://www.agiweb.org/geotimes/june08/article.html?id=feature_salt.html (accessed February 21, 2010). [iii] Patrick Lammie, Trevor Milner, Robin Houston. “Unfulfilled Potential: using diethylcarbamazine-fortified salt to eliminate lymphatic filariasis.” WHO Bulletin 85, 7 (July 2007), http://www.who.int/bulletin/volumes/85/7/06-034108/en/ (accessed February 21, 2010). [iv] “Filariasis.” http://en.wikipedia.org/wiki/Filariasis#cite_note-ITFDE-10 (accessed Feb 21, 2010). [v] Patrick Lammie, Trevor Milner, Robin Houston. “Unfulfilled Potential: using diethylcarbamazine-fortified salt to eliminate lymphatic filariasis.” WHO Bulletin 85, 7 (July 2007), http://www.who.int/bulletin/volumes/85/7/06-034108/en/ (accessed February 21, 2010). [vi] Cassandra Willyard. “Salt of the Earth.” GeoTimes, June 2008, http://www.agiweb.org/geotimes/june08/article.html?id=feature_salt.html (accessed February 21, 2010). [vii] GINA.“New DEC Salt to help eliminate Filariasis by 2015—Guyanese urged to take responsibility for their own.” GINA, Georgetown (July 24, 2003), http://www.gina.gov.gy/archive/researchp/statements/st030724.html (accessed February 21, 2010). http://www.agiweb.org/geotimes/june08/article.html?id=feature_salt.html (accessed February 21, 2010).